My HO scale ATSF GP50 3854 is one of the few models that I’ve kitbashed twice. The model started as a stock Athearn “blue box” Santa Fe GP50 that I bought years ago. At that time I wanted a Southern Pacific or Cotton Belt GP60. The only way to get one back then was to build one from a GP50. The resulting model is not really a very good rendition of a GP60. There are a lot of detail differences. 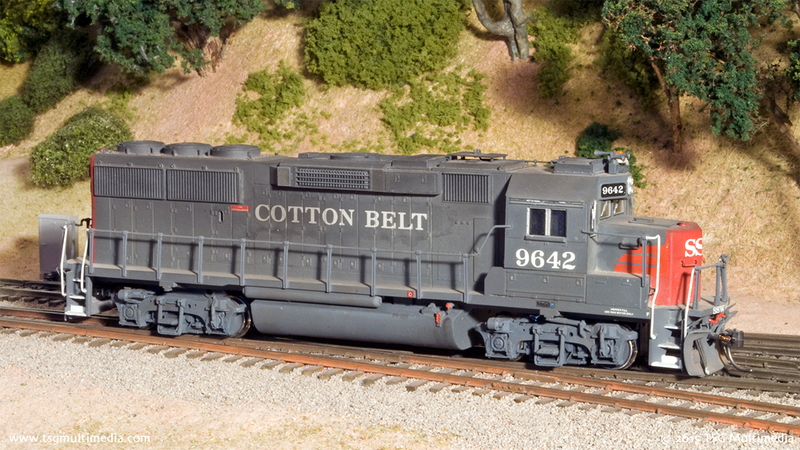 Nevertheless I went ahead with the project and built a model of Cotton Belt 9642. My model was okay for my skill level at the time but it didn’t measure up to my current standards. Those detail differences had become more bothersome to me. 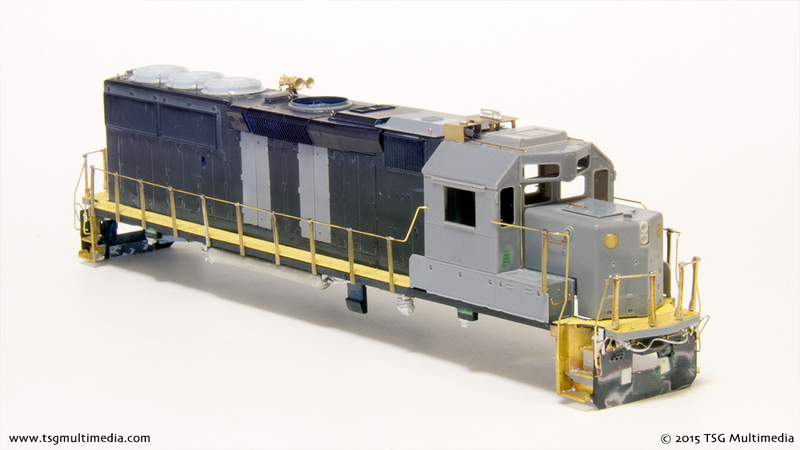 In recent years more accurate GP60 models have come on the market. I had some of those. I didn’t really need my model of SSW 9642 anymore. I thought about what to do with it. Eventually I decided to turn it back into a Santa Fe locomotive. I’d already put a modern Cannon blower bulge on the fireman’s side so I would need to model a late-production GP50. Fortunately Santa Fe had some of those. I started by stripping the old paint off the shell. I got rid of the aftermarket GP60 dynamic brake hatch. Fortunately I’d saved the original GP50 part. I cut out the fan and installed a new one from Cannon. I’d used a Cannon short hood on the model but it had the wrong hand brake on it. Santa Fe units had a ratchet brake. The Cotton Belt unit had a wheel. I put the old short hood in my spares box. I cut off the Athearn cab and battery boxes and built a new front end from Cannon parts. I used many other Cannon parts on the model. I added a walkway tread kit and anticlimbers. I also changed some of the hood doors and replaced the rear of the long hood. The step wells were incorrect for a late production GP50. I cut them out and made new ones from Railflyer kits. I don’t think these are available any more. They were difficult to build but did produce good looking step assemblies. I soldered the brass pieces together and then glued them onto the model with CA. I made new handrails from brass wire and Precision Scale stanchions. I custom fabricated the antenna stands on the roof from brass stock. The conduits are brass wire. I also did a lot of work on the pilots, adding uncoupling levers, MU hoses and cables. The original coupler mounts were cut off the chassis and new ones were build in the shell from laminated styrene sheet. The “Q” fans on in the radiator section are from Detail Associates. I notched the short hood and used a Detail Associates headlight casting to model the lowered 1990s-era Santa Fe headlight. 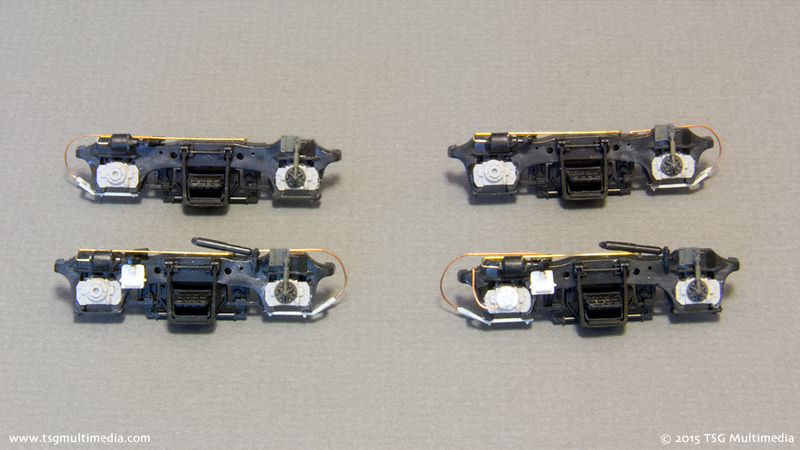 The aftermarket GP60 truck sideframes that I’d used on the Cotton Belt model were in poor shape so I got rid of them. 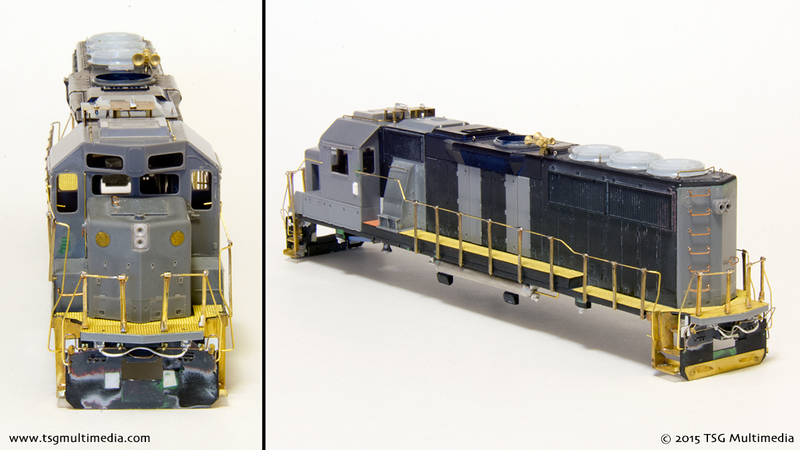 After studying photos I discovered that the GP50 sideframes for this model weren’t quite right for ATSF 3854. I ended up kitbashing my own based on a new set of Smokey Valley GP60 sideframes. I sanded off the wheel bearings and backdated them with Detail Associates parts. I reused the original Athearn small shock absorbers. The completed sideframes have brake lines and sanders. Two of them have spare knuckle holders and large shock absorbers. One has a speed recorder. All of the stock details were sanded off the fuel tank. I added new end caps made from .010 styrene sheet. Aftermarket parts were used for the fuel fillers and gauges. I added new air reservoirs and other plumbing from Details West. Numerous other small details completed the model. After priming I painted the shell with Scalecoat Santa Fe yellow with a couple drops of red added. When that was dry I masked the warbonnet and sprayed the model again with Scalecoat Santa Fe blue. The truck sideframes were painted silver and the frame was sprayed flat black. I used Microscale decals to apply the markings. The model is equipped with a LokSound Select DCC sound decoder. The headlights are warm white 3mm LEDs shining through fiber optic lenses. The ditch lights and number boards were illuminated with 603 size surface-mount LEDs. All of the lights can be controlled independently.